Biological imperatives assuaged Pam and I continue our stroll down Avenue Champs de Elysees. By this time the light rain has completely eased and the sun is drying our clothes. The Champs de Elysees is a broad street with wide footpaths and after the shopping section abruptly ends, the buildings on each side of the road give way to tree groves and gardens. The French have had the good sense to withstand the modern urge to coat every surface in bitumen or concrete and the footpaths are now pale coarse sand/fine gravel. Softer on the sole and the soul. To our right the imposing dome and glass barrel-vaulted roof of the Grand Palais des Champs Elysees demands attention, yet it is the much smaller (yet still large) twelve sided polygonal building of the Theatre Marigny to our left that draws our feet. Surrounded by beautiful gardens and apparently completely ignored by tourists the theatre’s peeling paint and obvious neglect somehow add to its charm. Upstairs through windows we see balustrades and artwork on the walls, at the entrance advertising for current and future plays. Obviously still functioning as a theatre the building is not open at this hour of day so we move on towards Avenue Winston Churchill which runs between the enormous Grand Palais and the smaller (yet still huge) Petit Palais. I remind myself to look up, look up, look up. You really don’t need to enter any art gallery or museum in Paris to see sculpture works by the ton. Just look up. The entrance to the Grand Palais is at the centre of an awe-inspiring facade of allegorical sculpture work that spreads along the entire length of the building (which is so long it is almost the entire length of the street). Stone columns support the roofline where at each top corner massive bronze statues of chariots drawn by rampant horses seem so alive I can almost see steam jetting from their nostrils and I fear being trampled by their pounding hooves. We try to take photos but an iphone camera just ain’t cutting it. While it may be possible to do things on the cheap and nasty in Paris, here at andtheywalked.com we are nice, however we are doing our best to make each Euro count. So we are just cheap. The Petit Palais pales in comparison to its across the road neighbour yet the Guide to Paris we are carrying indicates it is free to enter. 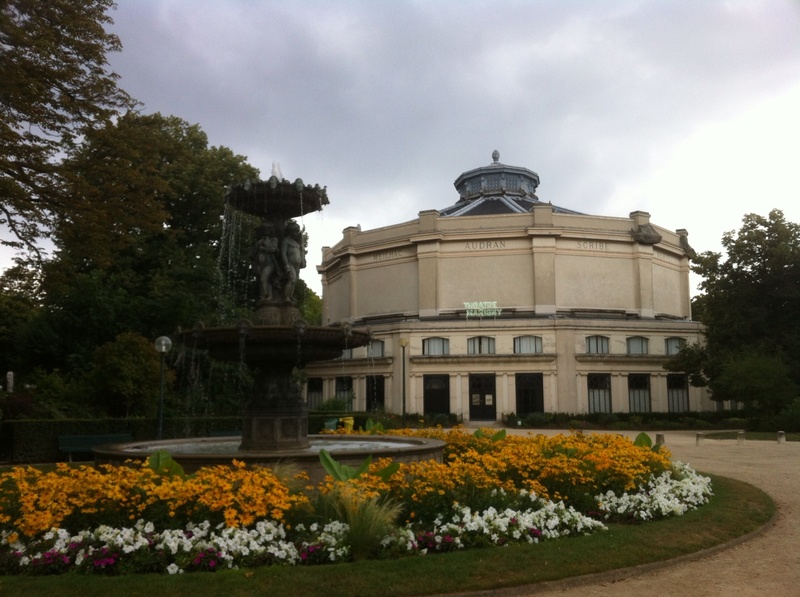 Today we are entering the Petit Palais. Look up, look up, look up. Magnificent frescos cover the vaulted ceilings of the enormous rooms filled with objects de art. 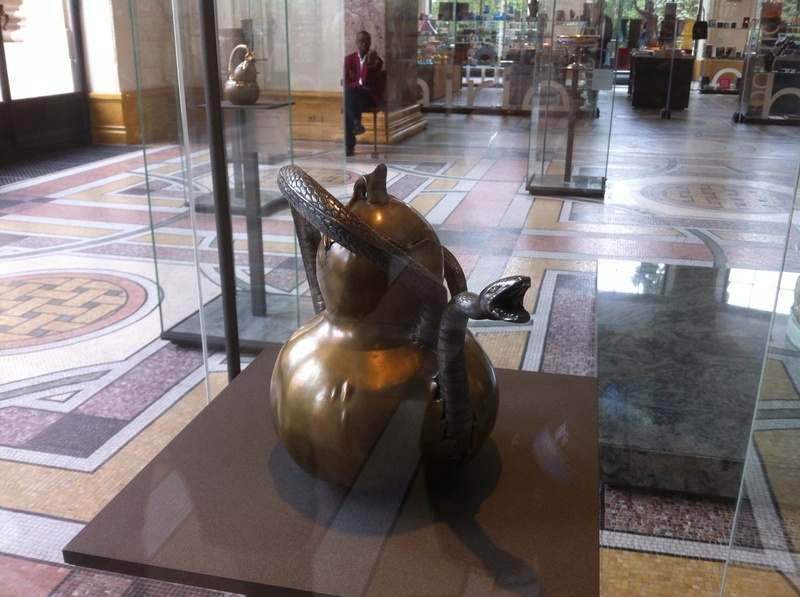 I see a metal teapot with a writhing snake body as a handle that pours through the gaping mouth poised to strike. I would start drinking hot drinks if I could pour each one from this pot. Amongst so much art it is the work of Fernand Pelez that most captures my attention. Given to lifelike portrayal of social issues of his time, his paintings are like ghosts inhabiting the gallery walls. 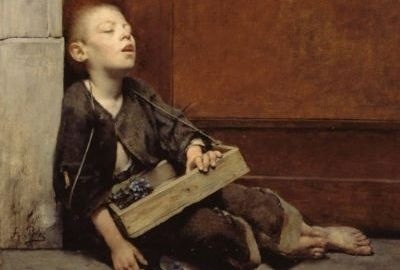 On the lower level of the Petit Palais his painting of a street urchin fallen asleep whilst selling dark grapes (noir) takes my breath away with its realism. So much to see and so little time. Even though I have never travelled before, or perhaps because I have never really travelled before, it really irks me to hear a person (tourist) say they have ‘done’ so and so or such and such, as in, “I have done Paris”. To have ‘done’ Paris you would have needed to live here for years. Years and years. Perhaps a lifetime. 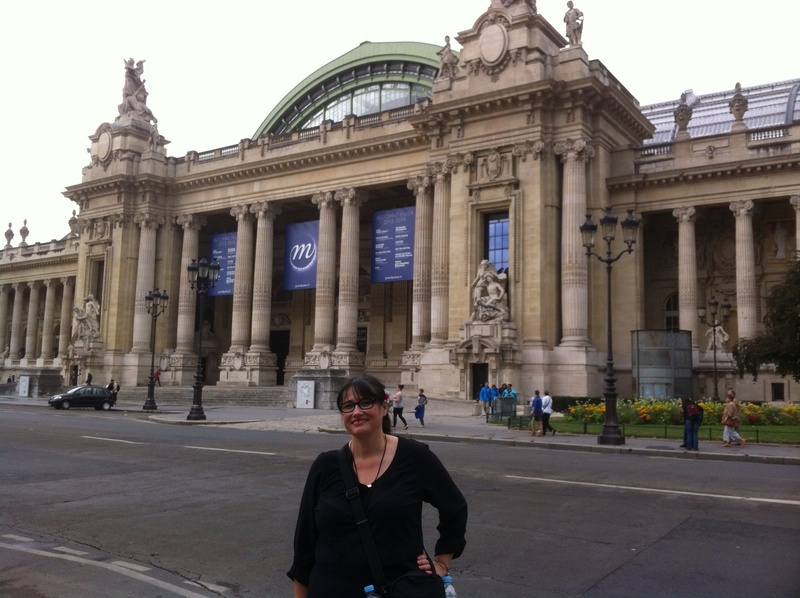 So having nowhere near ‘done’ the Petit Palais Pam and I move on. 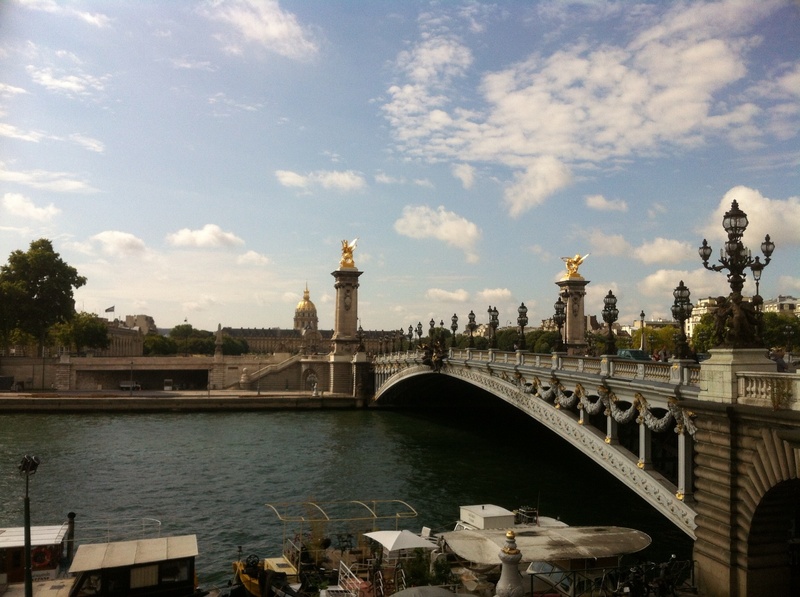 Back on the street we walk towards the Pont Alexandre III which is a bridge spanning the Seine that has a massive golden statue at each corner (I am running out of words to describe really really big). As we approach the bridge we notice a bride and groom walking in the direction we are about to turn. As mentioned in Part 1, earlier in the morning it has been raining, and the virginal white of the bride’s wedding dress hem is grey with street grime. Both she and the groom look disgruntled and they pace ahead of us without holding hands. We stop to help a young couple in love take photos and by the time we finish the bride and groom are out of sight. We continue down the street heading for the Place de la Concorde. Towards the end of this section between ponts (bridges) suddenly a rough looking lady coming towards us, stoops and scoops something up. She approaches us and opens her hand in which lies a wide gold mens wedding band. The ring looks brand new and she shows us the inscription inside. She is speaking rapid French but it is obvious she is asking us if the ring is ours. We answer no and she switches to English. She is missing one front tooth and seems down on her luck yet she urges me to take the ring. My personal position on wearing no jewelry remains unchanged by the experience and I politely decline. We say ‘finders keepers’ and urge her to keep the ring which she seems very reluctant to do. I think of telling her to melt the ring down and fashion a gold tooth from it. Luckily my mouth does not spurt the impertinence I am thinking as this lady is obviously noble and honest and deserves much kinder thoughts from strangers. Has true love fallen at the first hurdle and the ring been tossed aside in a scornful hissy fit? If so why not into the Seine from where there could surely be no redemption? Or has a slightly dampened groom let the ring slip unnoticed from his finger in the passionate rekindling of his love for his new bride? Paris is a city full of mystery and intrigue. And we are deep in the mix of it all. Pingback: CHARLES GIRAULT (FRANCIA,1851-1932) | "HIJO PINTOR"